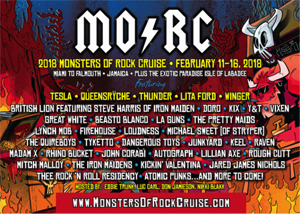 Confirmed line-up for the 2018 MONSTERS OF ROCK CRUISE includes: Tesla, Queensrÿche, Thunder, Lita Ford, Winger, British Lion featuring Steve Harris of Iron Maiden, Doro, KIX, Y&T, Vixen, Great White, Beasto Blanco, LA Guns, Pretty Maids, Lynch Mob, Firehouse, Loudness, Michael Sweet (of Stryper), The Quireboys, Tyketto, Dangerous Toys, Junkyard, Keel, Raven, Madam X, Rhino Bucket, John Corabi, Autograph, Lillian Axe, Rough Cutt, Mitch Malloy, The Iron Maidens, Kickin' Valentina, Jared James Nichols, Thee Rock 'N Roll Residency, and Atomic Punks, with more performances to be announced. Plus, Eddie Trunk and comedian Don Jamieson (VH1's That Metal Show), San Francisco bay area radio host Nikki Blakk and Luc Carl (SiriusXM's "Hair Nation") are the official cruise hosts and will moderate Q&A's and many other specially designed events crafted especially for this voyage. Check out the MOR '18 artist reveal and cruise experience videos below.